Building a water feature for your deck, backyard or garden does not require that you build a pond. Water features can be as simple as a watering can flowing into a clay pot or a several containers tiered and bubbling amid your flowers. You can build a water feature in as little as an hour once you've assembled your materials. Add ambiance and serenity to your patio or garden with an easy pondless water feature. Attach the hook to the top of the stake. Drive the stake into the ground wherever you plan to showcase your water feature. Your stake can be wood or metal, painted or left to appear rustic. Add a small brace or shelf to the stake that the front edge of the watering can will rest on. Hang the watering can from the hook, tilting it forward as if you were watering your flowers. Attach the back and front edges of the bottom of the can to the stake and brace where it meets, using waterproof adhesive. 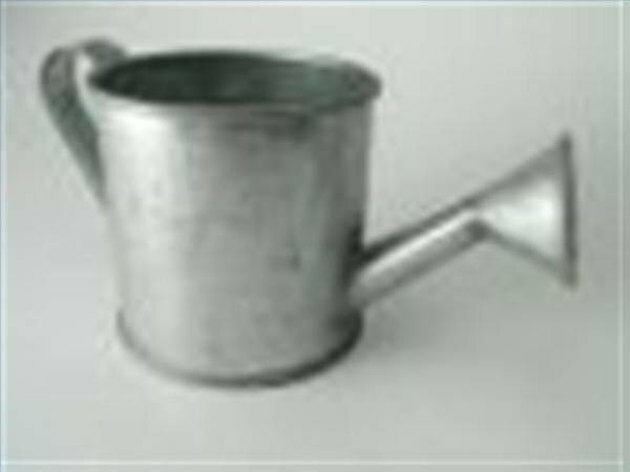 Position the reservoir beneath the spout of the watering can so that the water will flow into the container. If you're using a clay pot or planter, you will need to seal any holes with plumber's putty so that the reservoir is watertight. Attach the plastic tubing to the pump and place the pump into the reservoir container. Run the tubing up the inside edge of the container that rests closest to the stake, adhering it to the container with waterproof adhesive. Continue running the tubing up the back of the stake and down into the top of the watering can. You can cover the stake and the tubing with a vine or plant. Add stones or river rocks to the reservoir for stability and design. Fill the reservoir and the watering can with water before you turn on the pump. Make any adjustments necessary to the pressure of the pump so that the water flows into the reservoir.